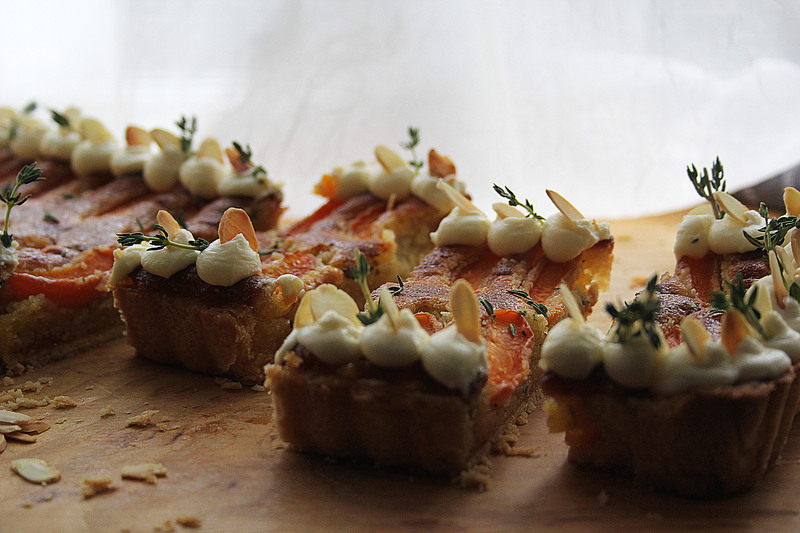 Crisp pastry, apricot jam, almond thyme frangipane, fresh apricots and a honey glaze make up this seasonal take on a classic Bakewell tart. It works really well with a big spoonful of creme fraiche and can be enjoyed warm or cold, perfect for this unpredictable British ‘summer’. Start off with the pastry. Place the flour, butter, caster sugar and lemon zest in a food processor and blitz until it resembles fine breadcrumbs (you can also do this by hand by rubbing the ingredients lightly between your fingers). Lightly mix the egg yolks and water in a cup then, with the processor running, pour in through the funnel. Stop blitzing as soon as the mixture clumps together then tip onto a clean surface and quickly shape into a disc. Wrap in cling film and chill for 15 minutes. Preheat the oven to 180c (fan) and lightly grease your tart case ( I used a long rectangular tin but this recipe will also work with a 20-22cm traditional fluted tin). Take your pastry and roll out to about 3mm thick on a lightly floured surface. Line the tin with your pastry, using a little extra to push it right into the corners. Trim any over hanging pastry from the edges and then cover with cling film and chill again for 10-15 minutes, until firm. Line your chilled pastry case with baking paper and fill with baking beans. Bake for 10-15 minutes (or until the sides are set) then remove the paper and beans and return to the oven for around 10 minutes (or until the bottom is sandy with no grey undercooked areas). Set aside while you make the frangipane filling and lower the oven temperature to 160c (fan). For the filling, cream together the butter and sugar (in a stand mixer with paddle attachment or with electric beaters) then add in the almonds and mix briefly until well incorporated. Crack in the eggs one at a time, beating well between each addition, then finally stir in the chopped thyme. Take your cooled pastry case and dollop the jam all over the base. Spread out evenly then pile on the frangipane and level off. 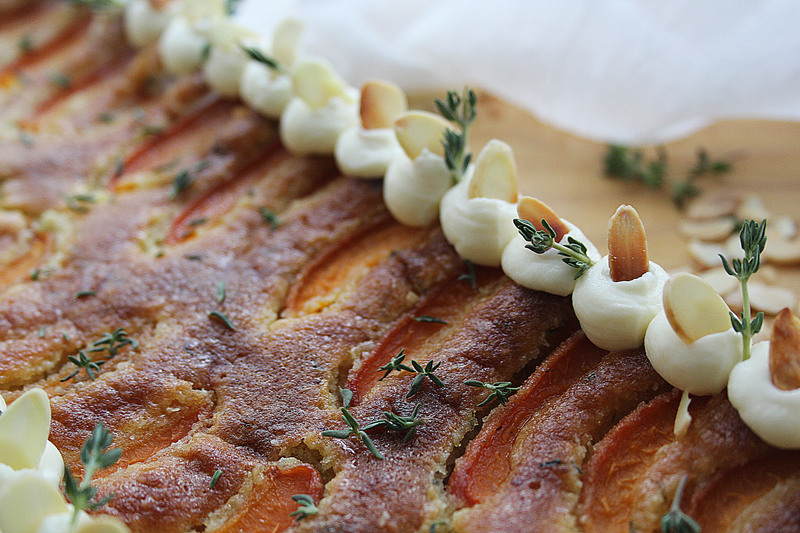 Top with the sliced apricots in a pattern of your choice then bake for 30-40 minutes until the top is golden. Heat the honey a little to loosen the consistency (either in a saucepan or in the microwave) then brush all over the top of the tart to add shine. 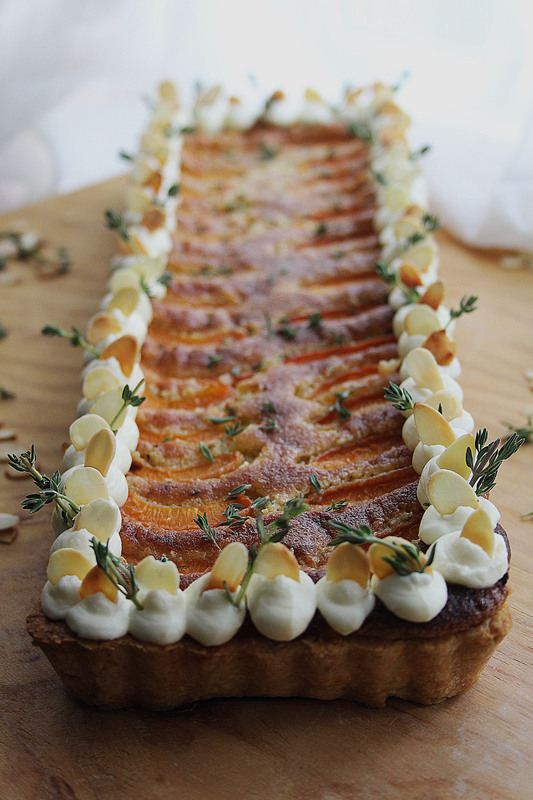 Once cooled, decorate the tart with thyme sprigs, almonds and creme fraiche, if you like.